Bo Li was born in China and moved to Hawai’i at the age of 13. 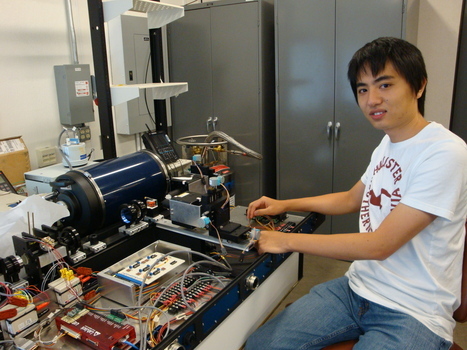 He is currently a senior at the Illinois Institute of Technology, pursuing a B.S. degree in Civil Engineering. In his spare time, Bo enjoys fixing computers, reading books, and hanging out with friends. Thousands of scientists observe the night sky to try to better understand the universe. They need small yet high-performance telescopes to collect cutting-edge data at visible wavelengths. The Institute for Astronomy (IfA) proposes to build an optical telescope with a primary mirror 1.85 m in diameter. The objective of this project is to design a mechanical support system for the primary mirror that would prevent mirror deflection greater than 100 nm during normal operation. First, we used GUI-PLOP, a finite element analysis (FEA) software package designed specifically for telescope mirror analysis, to determine the number of support points that could be used. Next, we created a realistic 3D computer model of the mirror and used regular FEA software to simulate the mirror’s deformation while in its horizontal position atop the support points. We iterated this model to determine the best location for each support point that minimizes mirror deformation. Once the support structure design is completed, we will test mirror deflection at a variety of tilt angles from zenith to horizon. Also, to prevent the primary mirror from sliding as it tilts, we will add a “sling” support (a rubber or metal strap around the edge of the mirror) to the model. The final model will be successful if it permits full movement of the primary mirror without exceeding its allowed deformation tolerance. If time permits, we will investigate additional designs that reduce the total number of support points, in order to minimize both construction cost and complexity.